This week, my article on research data management and collaboration inside and outside the academic library was published in Partnership. And here’s my shameless plug: you should go read it now. The article examines the different facets of research data management – collection, access, use, and preservation – and it locates them within the different part of the academic library. It is also advocates for real collaboration with our peers and stakeholders across the entire university, such as our colleagues in Research Offices and Research Ethics Boards (IRBs for our American friends). The article also examines the current policy gap regarding RDM in Canada, as well as ongoing efforts by different groups to develop RDM provisions in our granting formulas, and to provide resources and share expertise in order to ensure that we don’t create a paper tiger. What’s needed is not just policy but action, and both must be considered in the same breath. 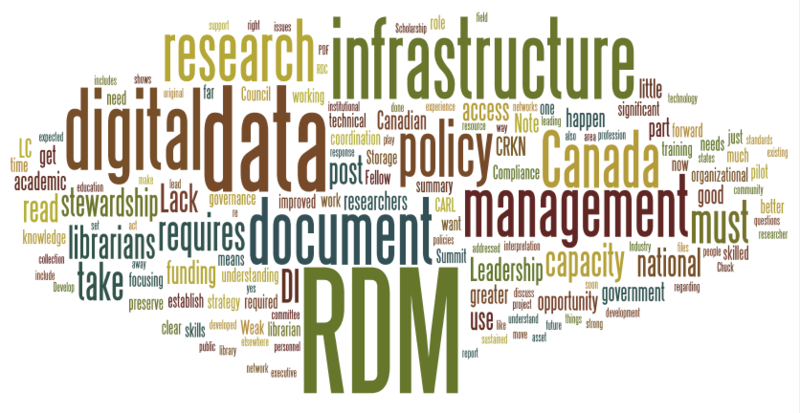 Research data management (RDM) has become a professional imperative for Canada’s academic librarians. Recent policy considerations by our national research funding agencies that address the ability of Canadian universities to effectively manage the massive amounts of research data they now create has helped library and university administrators recognize this gap in the research enterprise and identify RDM as a solution. RDM is not new to libraries, though. Rather, it draws on existing and evolving organizational functions in order to improve data collection, access, use, and preservation. A successful research data management service requires the skills and knowledge found in a library’s research liaisons, collections experts, policy analysts, IT experts, archivists and preservationists. Like the library, research data management is not singular but multi-faceted. It requires collaboration, technology and policy analysis skills, and project management acumen. This paper examines research data management as a vital information, technical, and policy service in academic libraries today. It situates RDM not only as actions and services but also as a suite of responsibilities that require a high level of planning, collaboration, and judgment, thereby binding people to practice. It shows how RDM aligns with the skill sets and competencies of librarianship and illustrates how RDM spans the library’s organizational structure and intersects with campus stakeholders allied in the research enterprise. For what it’s worth, collaboration has been a real buzzword at IASSIST40 and I’ve already been to a few presentations that share similar arguments as mine, and which definitely have the same spirit. I hope we’re all on to something with this, and I hope that we in Canada can get up to speed with our counterparts in other countries. Finally, this paper began in part from an Introduction to RDM session that I co-presented with Jeff Moon of Queen’s University at OLA in January 2014 (details here). Jeff has also written a great article on research data management, and it appears in the same issue of Partnership. He is on the forefront of RDM in Canada and knows how to get things done, so be sure to read his work, too. This week, a very significant document regarding the future of research data management and digital stewardship landed on my desktop. This is a PDF all academic librarians in Canada must read – whether or not you are tasked with RDM. If you are in IT, Research Facilitation, REB, Industry Compliance, or are a researcher or an administrator, then you should read this, too. It conveys the pressing importance of RDM to the profession, and it shows that we have an opportunity at hand if we take it – or a storm brewing if we turn it away. The document is the Summary Report for the Digital Infrastructure Summit 2014. This conference was hosted by the Leadership Council for Digital Infrastructure in January 2014. Group representation included CARL, CRKN, CANARIE, TC3+, and CUCCIO; in all 140 participants took part (p. 1). This document outlines the outcomes of the summit, which argued that RDM is lacking in Canada, that a sincere commitment to digital stewardship and not just technology is required to move forward, and the time to act is now (p. 1). If you are a Canadian academic librarian, download the document and read it now. Note: I was not a participant of this summit and am only summarizing the PDF in regards to RDM in Canada for librarians. I’m standing on the shoulders of giants when I write this post. This document asks What is Digital Infrastructure (DI)?, considers the existing problems that are hampering the development of an effective DI in Canada, and traces a clear path forward on which the Canadian research enterprise should move. Research Data Management and the people involved in it are front and centre in this document, and this means academic librarians and preservationists. The library has a significant role to play, and we are expected to contribute. One of the document’s biggest takeaways – and what I argue should be one of the first talking points you should use when discussing research data management – is that digital infrastructure (DI) is far more than technology alone. The executive summary states in clear, plain language that digital infrastructure includes “our ability to capture, manage, preserve, and use data . . . data are infrastructure, as are the highly skilled personnel who facilitate access to data, computational power and networks” (p. 1). DI requires “skilled knowledge management personnel” (p.1) who have technical capacity, but as we see elsewhere in the document, also can participate in local and national policy formulation and interpretation, understand project management, and have the capacity to collaborate and lead in their own field and in others. These are a suite of advanced “soft skills” that are concomitant IT knowledge and experience, and they are bound together with other essential criteria such as sustained funding and ongoing government and industry support, which allow research data management to flourish rather than wither on the vine. A successful solution that addresses near-team and long-team RDM issues requires skilled, committed resources on the ground who are leading the way. DI cannot be left to colleagues on limited term appointments or to our grad students. It demands institutional memory and it requires organizational vision. I’ve mentioned the argument in the above paragraph in a post long ago, but I’ll take this opportunity to link out again. Chuck Humphrey states this in clear terms when he explains that RDM is the “what” and the “how”, and digital stewardship is the “who”, and both are necessary requirements in RDM infrastructure. If you are a librarian, then read Chuck’s website. If you are a Canadian librarian, then read it again. And again. What’s wrong with Canada’s Digital Infrastructure? How to act. How to improve RDM. How to solve this crisis. Note: I am focusing on mainly on RDM and digital stewardship in this post; the original document gives equal attention to other areas such as governance, policy, and funding. The document makes a strong case not just for increased technical infrastructure but for greater knowledge management, project management, and policy analysis. We simply cannot allow ourselves to dump data files one after another onto a server and then hope that serendipity or an as-of-yet uncoded search algorithm will help us organize, preserve, and provide access to these files in the future. Research data – especially publicly funded research data – are a public good, and they require maintenance, management, and care. Tri-Council should take the next step and implement RDM policy under consideration. The benefits that RDM brings must be better articulated. Like any collection, data must be managed in part because its supports are not without cost. Management will include asking tough questions like what should be preserved, if we have the means and capacity to preserve it, and for what length of time. I recommend that we all have discussions about data collection policies as soon as possible. Locally, in our consortia, and nationally. Storage capacity for all disciplines must be addressed. RDM is in no way an “X not Y” proposition. We must serve all discipline, departments, faculties, and researchers. This is a tricky issue. We need our researchers to accept and be a part of RDM. Compliance should be required, but strict policies at the outset may prevent too much pushback. There will be give-and-take in the beginning. Note: The original document refers to “compliance” here. I don’t want to use that term. Do we need sticks? Yes. Do we want to use them? Only if we have to. But from the outside, we must have the attitude that everyone is a partner in this venture. Making things happen and getting things done. The LC provides a roadmap for action and results in its summary report from its 2014 Digital Infrastructure Summit. I am focusing on RDM-related activities and policy in this post since they are both so important to me, so I do encourage you to read the entire document yourselves to see the entire action plan. If you have made it this far in the post, then I offer you my congratulations. There is a lot of information to synthesize, but it is vital that academic librarians in Canada understand what is on the horizon for our profession, and what role will be expected of us. As this post shows, the work that follows – the opportunity we can take hold of – is as much resource-related and people-related as it is tech-related. To discuss digital infrastructure is to discuss the people who make it happen. Research Data Management doesn’t happen on its own. RDM requires careful planning, policy interpretation, technical capacity, and a thorough understanding of resource management. And yes, this is an opportunity for us. But we must be ready for what is to come. RDM will soon become the coordinated response to big data in Canada as it is elsewhere in the developed world, and it will mean work. But this is our work. It is our field. Take heed, take note, ask questions, and get set. Plan for this, and get set to play a leading role, because things are going to get busy. tl;dr : read this now. apply it to your work.